As you can see (in close-up, if you click the pic), fire-suppression operatives have moved quicker than a pack of Örebro devil girls to prevent a full-scale jub inferno. In her state of panic, the smouldering recruit has dropped her weapons, and three bullet-starved Yanks are closing in faster than you can say "National Rifle Association" to strip her firearms of their precious loads of ammunition. On the right, meanwhile, Reg defence hack Lewis Page is photographically primed to capture the action should the incipient blaze require the hasty removal of female clothing. Unsurprisingly, in all the excitement no one has clocked Abdullah Hassan Tali' al-Asiri launching a suicide bombing assault from the rear. The al-Qaeda batty-bomber's attempt to impose Islamic will has rather backfired, and his inadequate load of jacksie gelignite has done nothing more than move his arse a bit closer to his elbow. In case you're wondering, Lewis always dresses like that for work - on permanent standby should his bomb disposal skills be required to remove a Russkie limpet mine clamped to the hull of one of her Maj's naval vessels, or indeed in case a fellow journalist drops his or her iPhone down a particularly challenging khazi. 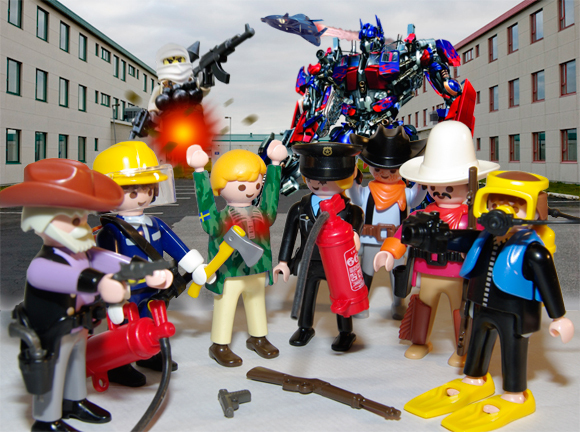 El Reg's world-famous Playmobil coverage can be found right here.